Sgt. Mitsui with the 10th Battalion of the Canadian Expeditionary Force. The mountie knew, of course, why the man was here, why those lined up behind him were here. The old soldier was signing up again, though this time not of his own volition — and not to fight. He stood in the line outside the livestock building on Vancouver’s fair grounds because the country for whose acceptance he had fought on the fields of France and in the halls of the B.C. legislature, had turned its back on him — and on 27,000 of his fellow Canadians. The mountie realized what troubled him about the veteran’s appearance. There were no service medals on his chest. A soldier who had gone to the trouble of donning an old uniform would surely take the time to pin upon it the record of his service. Why had this dignified-looking vet not done so? He didn’t have to speculate long. The old soldier slowly raised his arm; ribbons dangled from the fist clenched above the mountie’s desk. The old soldier met his gaze, turned on his heel, and walked away. The medals that Masumi Mitsui cast off in disgust in 1942 — the Victory Medal, the British War Medal and that eloquent Military Medal — were quietly retrieved by his daughter that day. And Mr. Mitsui would live to wear them again with pride and honour, though it would take decades for old wrongs to be righted. 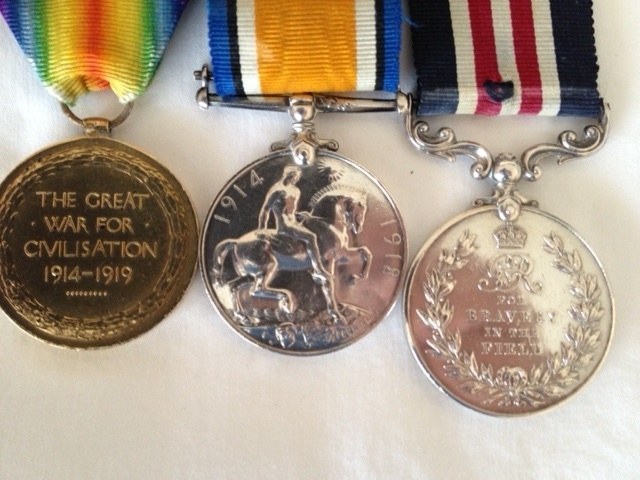 The medals that Masumi Mitsui's grandson, David, now cares for. Now the medals, and other mementos of Masumi Mitsui’s service to Canada and to Japanese Canadians are held with dignified regard by his grandson, David Mitsui of Edmonton. And David has shared them, and their story, with the Basement and Attic Archives Canada. Masumi Mitsui led a platoon of Japanese-Canadian soldiers up Vimy Ridge in April of 1917, was wounded at Arleux later that month, and was decorated for bravery at Hill 70 near Lens, France, four months after that. By the end of his first year in battle, 16 members of his Japanese-Canadian platoon had been killed; 17 had been so badly wounded, injured or laid low by disease that they had to be sent home to Canada; and as many a half-dozen more were in hospital in England. For a time, a mere seven soldiers remained under his command in the field. And yet, when he led the remains of his battered platoon across the Rhine barely a month after the Armistice in December, 1918, the hardest — and most heart-rending —sacrifices that Masumi Mitsui’s country would demand of him were still years in the future. When war was declared in the mid-summer of 1914, antipathy towards Canada’s Asian population ran high, particularly in British Columbia where their numbers were the greatest. A mere seven years before, thousands of Euro-Canadians, convinced that Asian immigration was a threat to jobs, had swarmed through Asian neighborhoods in Vancouver, ransacking businesses and assaulting those they found on the streets. The 1907 Race Riot remains a black day in Vancouver’s history. Mitsui worked as head waiter at Victoria's prestigious Union Club before the war. Despite a history of such treatment, the Japanese community in Vancouver rallied around Canada’s war effort, offering even to raise and train a Japanese battalion for the Canadian Expeditionary Force. Such overtures, however, were routinely rebuffed by the federal government. But as the war wore on, and the need for fighting men grew desperate, Japanese Canadians found recruiting centres more welcoming, especially those outside B.C. Of the more than 200 Japanese Canadians who enlisted during the First World War, almost 170 signed their attestation papers in Alberta. Most of these were B.C. residents who had left the province on a quest to serve their country. Among them was Masumi Mitsui. In the seven years he had lived in Canada, Mitsui had prospered. Fluent in English, he had risen to become head waiter at Victoria’s prestigious Union Club, a gathering place for B.C.’s rich and powerful. Now he, like other Japanese Canadians, saw serving his new country as a way to prove his worth as a citizen, and, perhaps, secure the rights that had been denied him. By the time Mitsui made it to France with the 10th Battalion early in 1917, all four divisions of the Canadian forces were preparing for their first battle together as a single unit, making plans that would come to fruition with surprising success at Vimy Ridge in April. The 10th Battalion commander was dismissive of the Japanese Canadian recruits under his command, even requesting they be transferred away from the fighting. But when he received even more Japanese Canadian soldiers as replacements, he put all 35 of them under the command of then-Private Mitsui. At least Mitsui could speak English, the Lieutenant-Colonel reasoned. Some members of the 11th platoon under Mitsui, then still a private. He is seated far left. There were scores of Japanese Canadians fighting at Vimy Ridge, in various battalions, usually operating as distinct units. Their non-Asian comrades-in-arms would later write of their fearlessness in battle. At the battle of Hill 70, near Lens, France, that August, while leading his platoon in an advance under a rolling barrage of Canadian artillery, Mitsui proved his mettle beyond any racially coloured doubt. He would later be awarded the Military Medal for his stalwart leadership, his bravery in battle and his selfless assistance to the wounded in No Man’s Land. 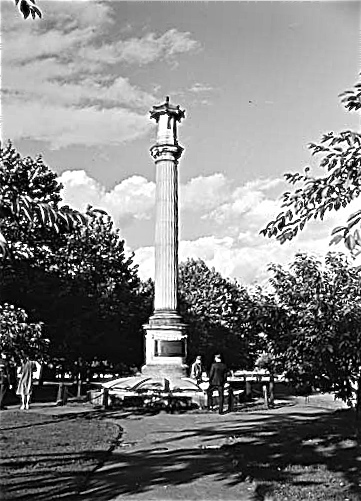 After the war, the Canadian Japanese Association raised $15,000 for a war memorial to mark the sacrifice of Japanese-Canadian soldiers and received permission to erect the monument, a tall column topped with a pagoda-shaped lantern, in Stanley Park. It was unveiled in 1920, at the beginning of a sometimes bitter decade-long effort to translate the sacrifices of Japanese Canadians in battle into political enfranchisement. The Japanese Canadian War Memorial unveiled at Stanley Park, Vancouver, in 1920. In 1931, Masumi Mitsui, then president of the Japanese-Canadian Branch of the Royal Canadian Legion founded in 1926, was among the leaders pushing legislation to give the vote to these veterans. Enfranchisement was approved by the narrowest of margins after rancourous debate. It would be another 18 years before the vote was extended to other Japanese Canadians. But voting privileges were of little use to the veterans in late 1941 when, after Pearl Harbour, all Japanese Canadians were ordered to register as “enemy aliens.” Earlier that year, the Canadian war cabinet had decided not to accept Japanese volunteers for the armed forces. By late February of 1942, all persons of “the Japanese race” were ordered to leave the B.C, coast. At the outbreak of the war, Masumi Mitsui had been not only a war hero and a political activist, but a successful businessman. His family had a 17-acre poultry farm in Port Coquitlam, near Vancouver, valued at over $6000. Under the terms of the relocation scheme, the property was seized and sold at auction. The family received little more than $2,000 in compensation before being relocated to an internment camp in in the B.C. interior. After the war, the Mitsui family was forced to rebuild its life in Canada from scratch. Masumi Mitsui, 98, salutes during the 1985 rededication ceremony for the Japanese Canadian War Memorial. When the internment began, the light atop the Japanese-Canadian war memorial at Stanley Park had been extinguished. It would not be reignited for more than four decades during which the contributions of Japanese Canadians to Canada had been belatedly recognized and celebrated. Chief among the dignitaries present for the rededication of the monument was Sgt. Masumi Mitsui, then 98, and standing proud in his Royal Canadian Legion regalia, his returned medals bright on his chest. The federal government would not officially agree to redress the injustices suffered by Japanese Canadians during the Second World War for another three years. But for Masumi Mitsui, the rededication ceremony was a vindication, final proof that the country for which he had given so much had been worth the sacrifice.